On this latest episode of TORT, the boys dive into the Phase 3 Marvel line up. Yeah, we're a little behind. 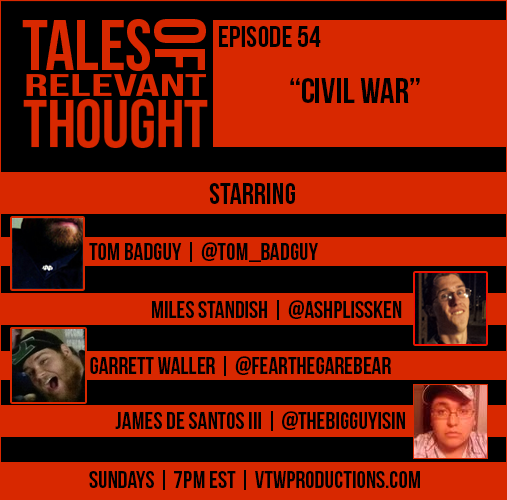 Much talk and debate focuses on Captain America: Civil War and what we want and don't want the Civil War to be(we discuss the comic as well). We also trade thoughts about the game No Man's Sky and consider PC and PS4 are really the only 2 ways to go for gaming at the moment. Steam Holiday Auction, Sony and Marvel discussing Spider-Man movies, game delays, and more on our latest episode! Enjoy!